Successfully Added Xiaomi Mi 8 6GB RAM 128GB ROM Snapdragon 845 6.21 Inch Smartphone Blue to your Shopping Cart. 6GB RAM, 128GB ROM, very large storage for you to keep all your favorite files, pictures and videos in the cellphone. Snapdragon 845 Octa Core CPU, providing fast and smooth running, allows you to enjoy the exceptional performance! 6.21" 18.7:9 Full Screen, large screen and comfortable visual experience, easy to hold in hand, too. 12MP+12MP Dual AI Rear Camera, 20.0MP Front Camera AI Beauify, helps you captures every precious moments in life and take spectacular pictures. This smart phone is designed with four curved glass body, using ultra light aluminum metal frame, so it is very comfortable to hold in hand, super light which you will not feel sore after holding it for a long time. With drop waist design arc, looks sleek and elegant, you will feel stylish with this smart phone! 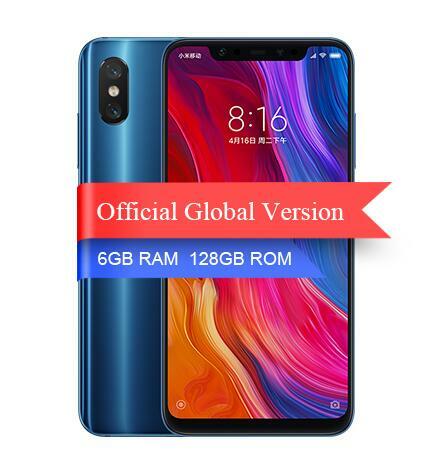 Xiaomi Mi 8 equipped with the worlds first dual-band GPS, mobile phone supports L1+L5 dual-frequency positioning and dual-band signal cooperation to effectively improve navigation accuracy in urban complex environments. Snapdragon 845 processor once again broke strong performance. With its fast and smooth running performance, this smart phone gives you the amazing use experience, whether it is shuttle between multiple apps or in a fierce battle game, it must be an indispensable partner for you! With this advanced infrared face recognition technology, you can unlock you cellphone with just a glance on the screen. Even in dark environment, unlocking the cellphone will not be a problem for Xiaomi Mi 8.